Just because you and your kids are vegans, Easter doesn't have to be a bust. There are many delectable Easter-minded vegan treats that are also organic, Fair Trade, and in some cases, healthier as well. For example, the beautiful Mama Ganache Easter Basket shown above. 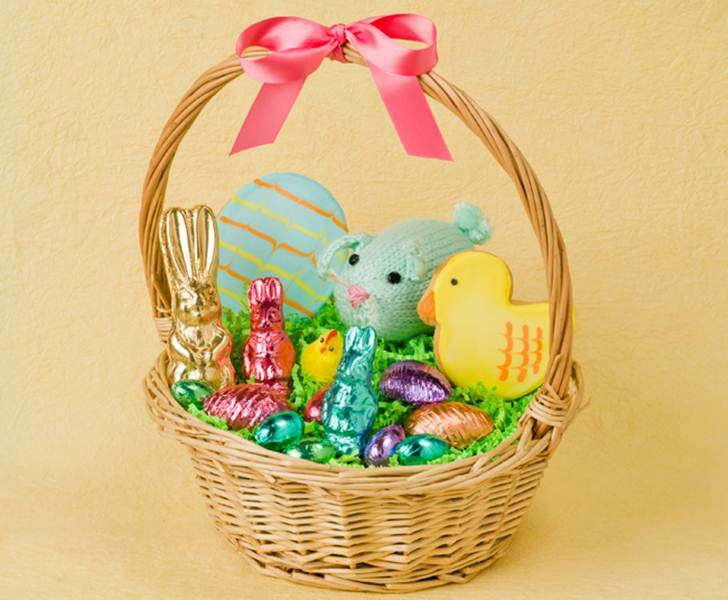 This lovely spring basket comes filled with chocolate bunnies, solid eggs, filled eggs, a cute stuffed Easter buddy, and two fantastically decorated Easter cookies. You can even customize your Easter basket with whatever treats you would like. $2.00 from each basket goes to Project Hope and Fairness to help the African cocoa farmers, and if you order this with dark chocolate your basket will be vegan, and soy lecithin free. Keep reading to see many other super fun vegan Easter treats. As you saw above, Mama Ganache has the perfect vegan Easter basket for your little honey bunny. 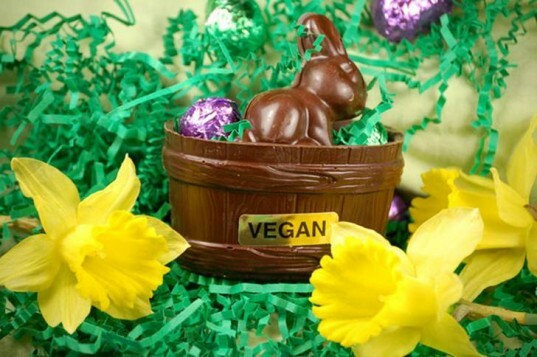 And they also offer a huge selection of other chocolate vegan Easter treats like sweet chocolate bunnies, pretty little colorfully wrapped vegan eggs, peanut butter filled chocolate eggs and much more. All of Mama Ganache’s chocolate is 100% organic and Fair Trade. This company also supports Project Hope and Fairness, a 501(3c) charitable organization whose main goal is to help cocoa farmers in the Ivory Coast, the source of 75% of America’s chocolate. For years vegans had to give up on Peeps which are made with animal products. However, Sweet & Sara has changed all that by not only offering a large selection of delicious vegan all occasion marshmallows but they also offer cute little VEEPS!, their cruelty-free version of Peeps! Sweet & Sara is the original maker of 100% gelatin-free, 100% vegetarian and vegan marshmallows and their adorable sugar coated marshmallow animal friends, Skipper the bunny and Sunny the chick allow your child to munch on an Easter classic without harming one little animal. The chick is coated with sugar naturally colored with beta carotene and chicks and bunnies come in nice little bags for gift giving. Strawberry Hill specializes in allergy-free treats for kids who otherwise wouldn’t be able to have sweets. They also have some beautiful spring-minded lollipops perfect for all Easter baskets. These lollies are made in a facility that does not process any of the eight major allergens (peanuts, tree nuts, wheat, milk, egg, soy, fish, or shellfish/crustaceans). The lollipops are made with bone char free sugar, no gluten with citric acid from non-GMO beet sugar. Lastly, Strawberry Hill lollipops are made in the USA and come in many adorable designs, from Easter eggs to bunnies to ducks to butterflies and more. YumEarth doesn’t depend on fake colors and flavors, but instead makes their treats with real fruit extracts and planet friendly ingredients grown on sustainable family farms. Many of their treats are organic and all are free of high fructose corn syrup and artificial dyes. YumEarth goodies also contain zero gluten, peanuts, or tree-nuts and many are vegan. Two of our favorite YumEarth treats for vegan kiddos are their yummy Easter minded Sour Beans and delicious organic lollipops. Sjaak’s Organic Chocolates creates a large variety of vegan products, including many for Easter. All their vegan goodies are free from milk, butter, eggs and gelatin and they use sugar that is non bone char as well. Furthermore, Sjaak’s Organic Chocolates carries 100% certified organic and uses Fair Trade cocoa, supporting the equality of all of the workers that make their treats. One of their cutest Easter offerings is their sweet vegan chocolate bunny in a basket shown above, but if that’s a little too much chocolate for your tot (is there such a thing as too much chocolate?) then you can also find mini chocolate eggs and more in their shop. If your goal is a healthy, but still sweet Easter, CLIF Kid has got your back with their tasty, fruit sweetened Zfruit Ropes. Each CLIF Kid certified organic Zfruit Rope is equivalent to one serving of organic fruit and is free of fat, artificial sweeteners and preservatives, and contains 0 grams of trans fats as well as only 70 calories per serving. In addition, Zfruit Ropes are also gluten free. Plus, kids love these fun ropes of fruit. My son BEGS for them at the store because they’re so yummy. CLIF Kid Zfruit Ropes are available in many flavors: Strawberry, Mixed Berry, Tropical Twist, Grape, Fruit Punch and Apple, and they slip easily into a healthy Easter basket. If you’re looking for even more vegan treats check out our Halloween candy list — it’s packed with vegan goodies, many suitable for stuffing into eco-friendly Easter eggs. As you saw above, Mama Ganache has the perfect vegan Easter basket for your little honey bunny. 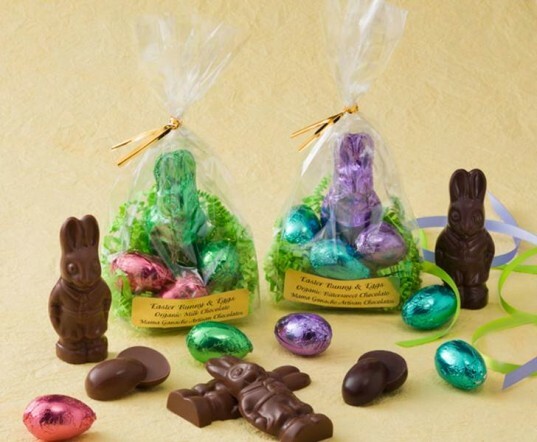 And they also offer a huge selection of other chocolate vegan Easter treats like sweet chocolate bunnies, pretty little colorfully wrapped vegan eggs, peanut butter filled chocolate eggs and much more. All of Mama Ganache's chocolate is 100% organic and Fair Trade. This company also supports Project Hope and Fairness, a 501(3c) charitable organization whose main goal is to help cocoa farmers in the Ivory Coast, the source of 75% of America's chocolate. For years, vegans had to give up on Peeps, which are made with animal products. 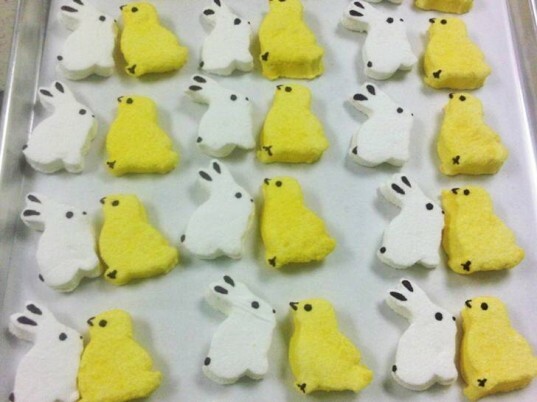 However, Sweet & Sara has changed all that by not only offering a large selection of delicious vegan all occasion marshmallows, but they also offer cute little VEEPS!, their cruelty-free version of Peeps! Sweet & Sara is the original maker of 100% gelatin-free, 100% vegetarian and vegan marshmallows, and their adorable sugar coated marshmallow animal friends, Skipper the bunny and Sunny the chick allow your child to munch on an Easter classic without harming one little animal. The chick is coated with sugar naturally colored with beta carotene and chicks and bunnies come in nice little bags for gift giving. Strawberry Hill specializes in allergy-free treats for kids who otherwise wouldn't be able to have sweets. They also have some beautiful spring-minded lollipops perfect for all Easter baskets. These lollies are made in a facility that does not process any of the eight major allergens (peanuts, tree nuts, wheat, milk, egg, soy, fish, or shellfish/crustaceans). The lollipops are made with bone char free sugar, no gluten with citric acid from non-GMO beet sugar. 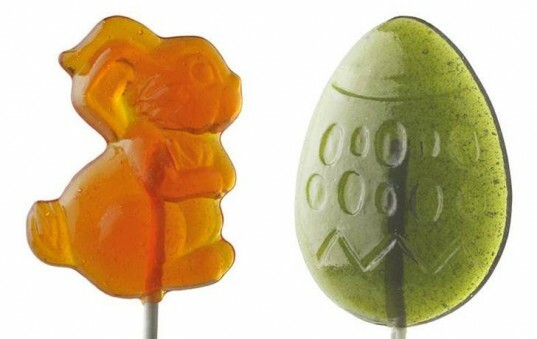 Lastly, Strawberry Hill lollipops are made in the USA and come in many adorable designs, from Easter eggs to bunnies to ducks to butterflies and more. YumEarth doesn't depend on fake colors and flavors, but instead makes their treats with real fruit extracts and planet friendly ingredients grown on sustainable family farms. Many of their treats are organic and all are free of high fructose corn syrup and artificial dyes. YumEarth goodies also contain zero gluten, peanuts, or tree-nuts and many are vegan. 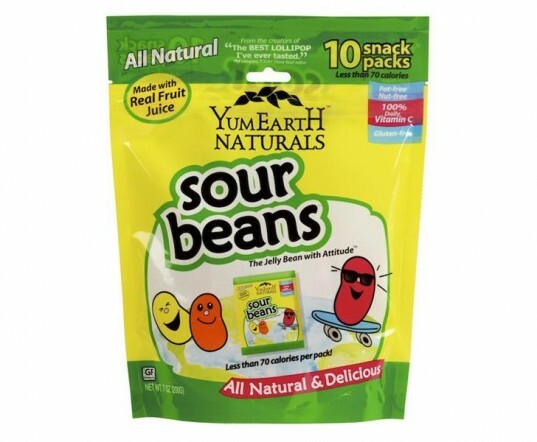 Two of our favorite YumEarth treats for vegan kiddos are their yummy Easter minded Sour Beans and delicious organic lollipops. Sjaak’s Organic Chocolates creates a large variety of vegan products, including many for Easter. All their vegan goodies are free from milk, butter, eggs and gelatin and they use sugar that is non bone char as well. Furthermore, Sjaak’s Organic Chocolates are 100% certified organic and they use Fair Trade cocoa, supporting the equality of all of the workers who make their treats. One of their cutest Easter offerings is their sweet vegan chocolate bunny in a basket shown above, but if that's a little too much chocolate for your tot (is there such a thing as too much chocolate?) then you can also find mini chocolate eggs and more in their shop. If your goal is a healthy, but still sweet Easter, CLIF Kid has got your back with their tasty, fruit sweetened Zfruit Ropes. Each CLIF Kid certified organic Zfruit Rope is equivalent to one serving of organic fruit and is free of fat, artificial sweeteners and preservatives, and contains 0 grams of trans fats as well as only 70 calories per serving. In addition, Zfruit is also gluten free. Plus, kids love these fun ropes of fruit. My son BEGS for them at the store because they're so yummy. 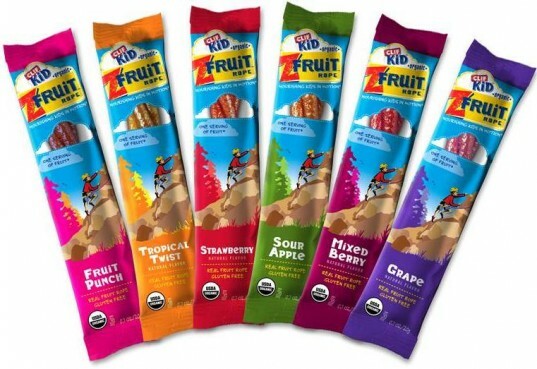 CLIF Kid Zfruit Ropes are available in many flavors: Strawberry, Mixed Berry, Tropical Twist, Grape, Fruit Punch and Apple, and they slip easily into a healthy Easter basket. If you're looking for even more vegan treats check out our Halloween candy list -- it's packed with vegan goodies, many suitable for stuffing into eco-friendly Easter eggs.